It was a cracking tie in which Batley played a full part and they almost forced extra time. Bradford led 6-0 at half-time but Batley hit back just two minutes after the re-start when Johnny Campbell forced his way over from acting half-back and Dave Scott landed a towering touchline conversion to level matters. James Brown and George Flanagan had been yellow carded on the stroke of half-time following a brawl and Batley’s Toby Everett was sin-binned after 52 minutes for a late tackle on Matty Wildie. Jordan Lilley edged the Bulls ahead with a 57th-minute penalty before Flanagan received his second yellow card of the match and was sin-binned along with Batley’s Lewis Galbraith. Batley had chance to level but Scott was just short with a long-range penalty attempt. Bradford looked to have sealed victory as Lilley, Brandon Pickersgill and Jake Webster linked to send Ethan Ryan stepping over for a crucial score, which Lilley converted to put the visitors 14-6 ahead. Batey weren’t finished and, having taken play close to the line, Dominic Brambani scooted through a gap and dived over for the try. Louis Jouffret took a quick conversion to reduce the arrears to two points. Batley tried valiantly to force a final attack in the closing stages but Bradford held out. Ross Oakes’s 28th minute interception proved the only try after a pulsating first 40 minutes but Batley were twice denied when they were held up over the line. Bradford made a bright start playing down the slope but from their best early effort Rhys Evans and Wildie were both tackled close to the line by Batley’s excellent defence. Batley attacked on the back of a penalty and Dane Manning spotted a gap after they moved left but the Bulls defence got across to tackle him into touch. A dangerous kick to the in-goal area by Louis Jouffret was scooped dead as the Bulls were forced to drop out and when Batley drove play close, Alistair Leak darted over from acting half-back but was judged held up. Manning and Michael Ward were also tackled close to the Bradford line following powerful drives. The deadlock was broken in the 28th minute when Oakes intercepted Jouffret’s attempted long pass and raced unopposed to score to the left of the posts, with Rowan Milnes converting. Batley created another excellent chance as James Brown drove the ball in and off-loaded one handed to Jouffrett before Jack Downs powered over the line only to be judged held up. As the half-time hooter sounded a brawl erupted following a fierce tackle on George Flanagan. When calm was restored, Flanagan and Brown were sent to the sin-bin, bringing an end to a cracking first half. The drama continued after the break but is Bradford’s large travelling support who celebrated at the final hooter. 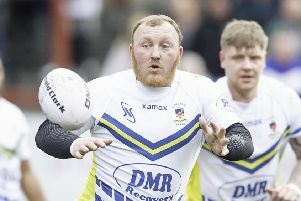 Batley Bulldogs: Scott; Reittie, S Wood, Galbraith, Campbell; Jouffret, Brambani; Gledhill, Leak, Everett, Manning, Downs, Dickinson. Subs: Brown, Smeaton, Hamingway, Bretherton, Ward, Yates, Tomlinson. Bradford Bulls: Pickersgill; Evans, Gibson, Oakes, Ryan; Milnes, Lilley; Kirk, Wildie, Magrin, Farrell, Minchella, M Wood. Subs:Hiscox, Webster, Crossley, Flanagan, Green, Storton, Milton.